Five-digit ZIP Code maps make excellent market analysis tools. Demographic data such as population, income and age can be displayed on ZIP Code maps using different colors to shade the values. You can also use ZIP Code maps to show number of households, consumer spending, sales volume of your products and other important market data. This map also represents a radius map. 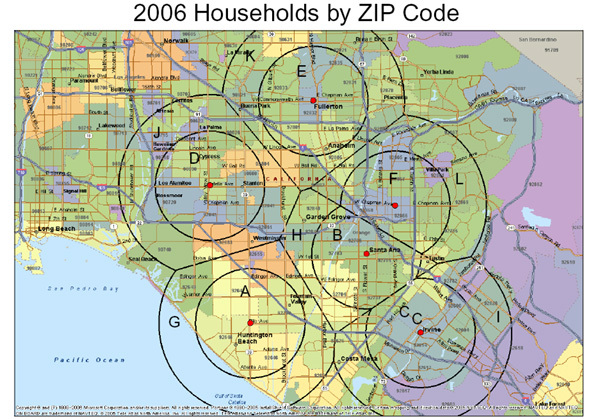 Mapping Analytics can provide ZIP Code maps and ZIP Code centroid maps, which show points at the center of each five-digit ZIP Code. Because ZIP Codes change often, for accurate analysis you should get a subscription to ZIP Code maps that are updated on a quarterly basis.